Personal injury attorneys can now edit new or existing Microsoft Word, Microsoft Excel, and Microsoft PowerPoint documents from anywhere using the same Office Online interface that they’re familiar with. The result is a truly collaborative, productive, and secure platform for legal success. With the introduction of our Microsoft Office Online integration, we’ve furthered our objective of helping personal injury attorneys become more productive and run their firms more efficiently. CloudLex, Inc. (https://www.cloudlex.com) innovator of the Legal Cloud, has announced it will offer its customers complete integration with Microsoft Office Online. 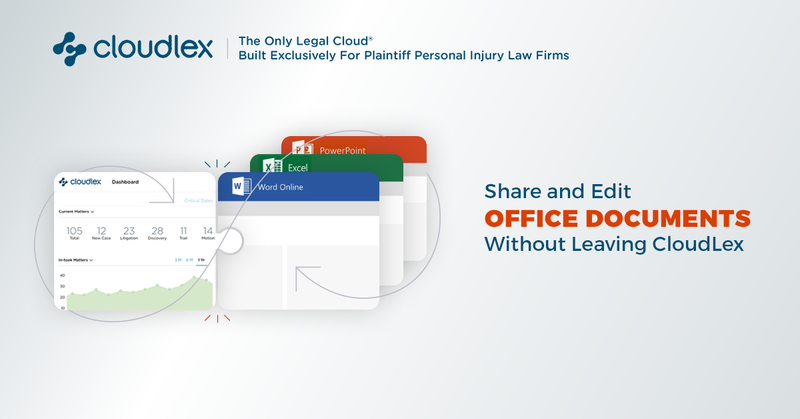 With CloudLex’s Office Online integration application, law firms benefit from the full functionality of Office Online, while simultaneously accessing vital case information in CloudLex, leading to an increase in efficiency for its users. Team members can now edit new or existing Microsoft Word, Microsoft Excel, and Microsoft PowerPoint documents from anywhere (at the same time as their colleagues) using the same Office Online interface that they’re familiar with. The result is a truly collaborative, productive, and secure platform for legal success. Already a Microsoft BizSpark Plus partner, CloudLex is committed to nurturing its relationship with Microsoft moving forward by continuing to deliver innovative personal injury applications that help its clients to successfully run their practices. What this means for personal injury attorneys is increased productivity. All users need is internet access to create, upload, and edit their Office Online documents from anywhere. Updates made in CloudLex are automatically reflected across all team members and devices, and users can see who is looking at their documents in real time. This increased transparency leads to fewer check-ins, simplified workflow, and faster turnarounds for their clients. With CloudLex’s Office Online integration, users don’t have to sacrifice functionality or safety for simplicity. And the entire platform resides on a HIPAA compliant server, also hosted by Microsoft, so users know their data is secure. CloudLex is a cloud-based technology designed exclusively for plaintiff personal injury law firms. Through its comprehensive suite of innovative applications, CloudLex enables attorneys to build, manage, and grow their practice.